I'm pretty sure there's no perfect separation, so the problem is probably overfitting right? Obviously I shouldn't be avoiding variables that give me a separation problem. So I looked it up and people suggested overfitting, which can be handled with LASSO. LASSO told me 10 variables were worth using. But if I include them all, again I get this "0 or 1 occurred" error message. That's not everything but I think you get the point. Here's the D matrix from the SVD of my model matrix. I got an "cannot rescale a constant/zero column to unit variance" error without the third line, so I added that in to remove constant/zero columns. 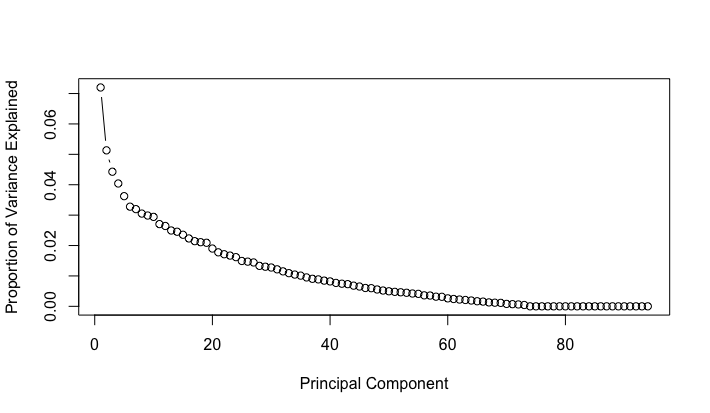 If I run a glm with the first 5 Principal Components from my PCA analysis, the auc is .8864 which is pretty good I think. But since my overall PCA analysis looks bad, I guess I'm stuck doing univariate analysis for each variable at a time? Getting fitted values that are 0 or 1 is not itself a problem, nor it is necessarily a sign of over-fitting. Other things being equal, getting fitted probabilities near to 0 or 1 is good rather than bad, suggesting that the predictor variables are correlated with the response. The lack of convergence is the same -- it is just a consequence of the 0 or 1 fitted values. Looking at the summary table you give, it is evident that most of the coefficients and standard errors in your table are actually infinite. It is well known that logistic regression does not yield usable z-statistics in this situation. You need to use likelihood ratio tests (LRTs) instead. The variables may well be highly significant by LRT even if the Wald p-values in the summary table were all near 1. See p-value from a binomial model glm for a binomial predictor for an example of this. but beware that the p-values you see are order dependent. This is a "sequential analysis of deviance table". Each variable is added to the model one at a time, in the same order you included them in the model formula. Each variable is adjusted for the variables above it in the table, so each p-value tests whether that variable adds something useful over the variables already in the model. If you change the order of the variables, then the p-values will change as well. It is also evident that you do have over-fitting in the sense that you are including too many predictor variables that are collinear with one another and therefore mutually redundant. You cannot possibly interpret the logistic regression with 25 variables, and it is likely to be pretty useless for prediction as well. If the overall model is not significant, then there is nothing to be done. In that case, trying to do any model selection would be purposeless. If the overall model is significant, then you have the problem of which variables to keep. I don't agree that the LASSO is useful here, because it has treated all the columns of the design matrix as continuous covariates. It has not taken into account the fact that columns are grouped by factor. There are lots of ways to proceed, but I would be tempted to just try logistic regression with one factor or variable at a time, and seeing if any of the individual variables give you good prediction. would tell you if you have representatives of all races at all college levels. If race and college are highly correlated, then they might be mutually redundant in your model. Same for other variables such as gender and sexor. A bit of common sense might be required, instead of use of automatic procedures. Not the answer you're looking for? Browse other questions tagged r regression logistic separation or ask your own question. Terrible logistic model gives perfect results? Will the p value become useless in such case: logistic regression with perfect separation?